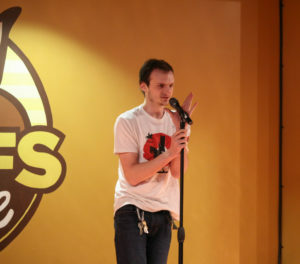 The first Profs Spotlight of the fall semester brought music and comedy to the Profs Place stage last Monday. Profs Spotlight, organized by the Chamberlain Student Center and Campus Activities (SCCA), allows students of all majors and walks of life to showcase their unique talents. Between stand-up comedy, show tunes or even the occasional polka, no set of talents is off limits down in Prof’s Place. Monday’s performances opened with a small number from host and Director of Live Events for the Student University Programmers Devon Dyer, performing an acoustic rendition of Cyndi Lauper’s “Time After Time” alongside junior music major Lucas Sheary before the show officially began. “It was definitely pretty nerve-wracking but after being up there for a little bit the nerves shaked off and I was good to go… I forgot half the words, but I kept going,” Dyer said, who hadn’t performed live in years. 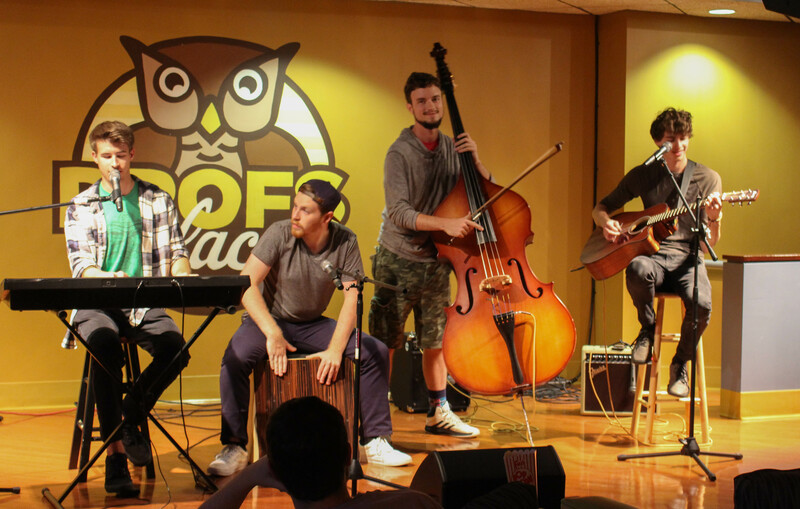 The first act of the night was Steve Solkela, who on top of having performed at Profs Spotlight four times prior, had also won 2016’s Battle of the Bands – opening for rock group American Authors at Hollybash that April. Polka-influenced at heart, Solkela’s own musical ingenuity showed through in his performance, playing the accordion while simultaneously hitting a small bass drum to his side with a foot pedal, hitting a triangle between beats and even using a slinky as a makeshift percussive instrument. Performing original pieces such as “A Sunny Day in Glassboro,” “Accordion To Me I’m Awesome,” as well as a heartache inspired tune “Battleaxe,” Solkela noted that a lot of his creativity is drawn from his own experiences. Brown, a longtime member of Highland High School’s theater and choir program, was thankful that his teachers helped him pave his own way. 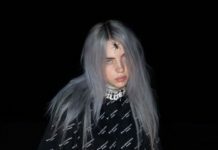 Benson, who avidly goes to and competes in singing competitions at anime conventions, noted some of the challenges that go into these performances. Another set of returning faces to the Profs Place stage were sisters Mariah Francisco, a second year graduate student, and junior elementary education major Kaitlee Francisco, who likened Profs Place to their living room and welcomed the audience in with covers of Lady Gaga’s “You and I,” The Calling’s “Wherever You Will Go” and X-Ambassadors’ “Unsteady,” as well as several others. Having “unofficially” been performing together for their entire lives, the sisters noted some of their earlier influences for getting into music. “Our dad really liked singing, but we used to sing Celine Dion’s “My Heart Will Go On” – that’s the earliest song I can remember us singing at home,” Kaitlee said. “Singing on stage started when we both got to college here, because there were more opportunities for us,” Mariah said. 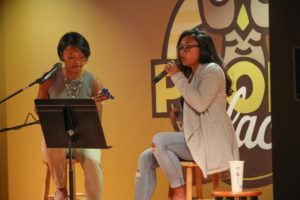 Kaitlee noted the two of them had been thankful to have performed not only at Profs Spotlight but also at Boro in Lights, Holiday Helper, as well as a lot of the Office of Student Activities, SUP and SCCA venues. Last year’s Battle of the Bands winners, Burn Moore, also graced the stage in the penultimate performance of the night. 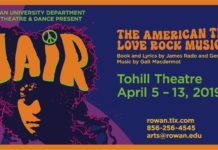 With an alternate sound and original songs such as “Psychogenesis,” “Dear Darling” and “Gimme More Time,” they were happy to return to Rowan to perform yet again. “I mostly like pop stuff, but I also like a lot of classic rock and alternative,” singer Andrew Moorer said, noting how musicians like Bruno Mars influence his writing. Meanwhile, other band members Zach Birnbaum (guitar), Dean Mason (bass), and Max Miller (drums) touched on some of their other influences, including the likes of Dream Theater, Rush and John Mayer. The final act of the night came in the form of stand-up comedy from senior radio, television and film major Nathan Jones. “For me, I keep a bible on me at all times of just thoughts and observations,” Jones said. 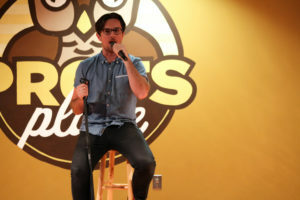 “Mostly, my influences come from Marc Maron – like a ranty, self-deprecating thing,” Jones said, also citing the likes of Ron Funches and Rory Scovel as comedic muses for his own brand of humor. Ideally, Jones would have come a little bit more prepared for his set, but he still remained optimistic. The next Profs Spotlight is set for Monday, Oct. 2, and anyone interested in performing can register through ProfLink.